The Navajo Yei sculptures are a series of mythical spiritual holy figures collectively known as Yei Bei Chei and each figure possess different curative powers. The Holy Man can summon these powers to cure sickness by singing and drawing pictures of the desired figure in the sand. The sick person will then sit on the figure and the cause of the illness will be drained from the person and deposited into the sand figure. Then the Medicine man tosses handfuls of sand in the four directions to be scattered by the winds. Most commercial examples of Yei figures are found in sand art and in rug weavings. Relatively few examples are available in silver spoons, but the resourceful Navajo's are always willing to meet tourist demands. The supernatural Yei figure is probably a derivative of the Kachina. The square headed figure is usually male and the round headed figure is usually female. 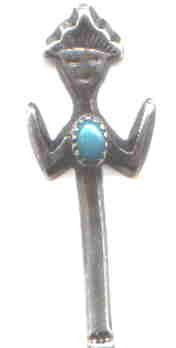 This Yei figure has a nice piece of turquoise mounted in it and carries the mark of Francis Jones (4.2"), but no purity mark. I am pretty sure that it is silver. I am not sure as to the exact meaning of this symbol. It looks to me like a double "s", but it may refer to the wind (5.1"). If any readers care to enlighten me, I would be appreciative. This spoon carries a mark of "M" and the word "sterling"